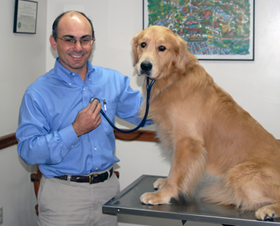 Yankee Golden Retriever Club hosts health screening clinics twice each year, in the spring (usually March) and in the fall (usually November). Eye and heart screening exams are offered as well as SNAP 4Dx testing, Microchips, and Blood Draw for Canine Genetic Testing (Optigen or Pawprints Genetics) and Canine Health Research. At some clinics Titers, OFA Hips/Elbows, BAER exams, and ultrasound screening may also be available. Preference is given to Golden Retrievers, but other breeds are most welcome. The Golden Retriever Foundation will pay for OFA eye registrations for any Golden 8 years and older (more info). Check this year's Yankee Events Calendar for more info.